The 2010 National Education Policy of Bangladesh strongly suggests the availability and use of audio visual materials for teaching English classes. To supplement the government, in 2012, SJ program has taken an initiative on interactive content development for making classrooms more participatory and effective. 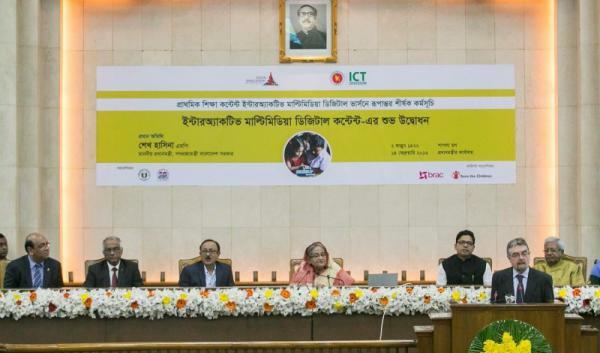 In 2014, the Ministry of Posts, Telecommunications and Information Technology (MoPT&IT) signed a MoU with Save the Children for developing the e-Content in English with the supports of DPE and National Curriculum and Textbook Board (NCTB) under “Developing Interactive Multimedia digital version of primary education contents. A working group, consists of practicing teachers, Upazilla Resource Centre Instructors, Instructors of Primary Training Institute (PTI), Experts of NCTB, DPE got involved closely in developing the contents. The e-Content includes various activities, games and animation to help the students learn English, while also providing them more opportunities to listen and speak in English. The developed contents have been approved by the Chairman NCTB and ready to pilot testing in schools that have laptop and projector. The e-Contents covered all lessons of the textbooks. In addition, attainable competencies, learning outcome and teaching methodology are incorporated in all the lessons in the e-content. The audio visual materials along with the special teacher training make the English classes pedagogically compatible with more communications, practice, activities and assessment. The developed contents of class one and class two, English, were inaugurated by Shaikh Hasina, Honourable Prime Minister of Bangladesh. Save the Children and BRAC organized the program under the guidance of ICT Division, Ministry of Posts, Telecommunication and IT. BRAC developed contents on other subjects. The primary schools across the country can use all the developed contents in the classrooms. Teacher training manual for using e-content in the classroom have been developed with Brac Institute of Language in collaboration with teachers and Instructors of Upazilla Resource Centre (URC) and Primary Training Institute (PTI) Instructors. The training module was developed based on the previous textbook and now the updating of the training modules are in progress based on the newly published contents and textbooks of 2015 and 2016. The contents of class one & two are developed for both computer and android based devices and that covered all lessons of the textbooks published in 2015.